Agnes was having such a good time at the playground, fooling around with the minions, until she fell off and bruised her face and knees. Poor little Agnes! She feels so sad now. Her teeth hurt too. She will need specialized treatment now so here is where you come in, girls! Oh no! Poor little Rapunzel has been playing in the yard all day, and has fallen. Her legs hurt a lot, and she is really sad. 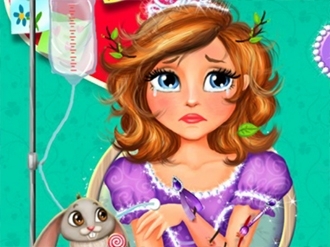 Help poor little Rapunzel get better by taking all the necessary steps. When Rapunzel's playground accident becomes just a thing in the past, cheer her up with a new dress!